If you would like to contact our past clients personally to get first hand knowledge on NZH&AS please contact us. I could bore you with a long story about how I first met Craig and Jenny in 2017 and how I was so amazed with NZ Horn & Antler that I came back the next year with my girlfriend and we had the time of our lives with Hunter and Malcolm on the beautiful green hills of the south island. 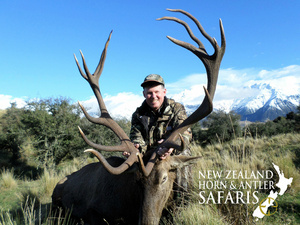 I could tell you I came back for the quality of the game that NZ Horn & Antler have to offer (463” of bone to be exact). I could tell about the amazing culinary delights that welcome you home after a full day of chasing game. 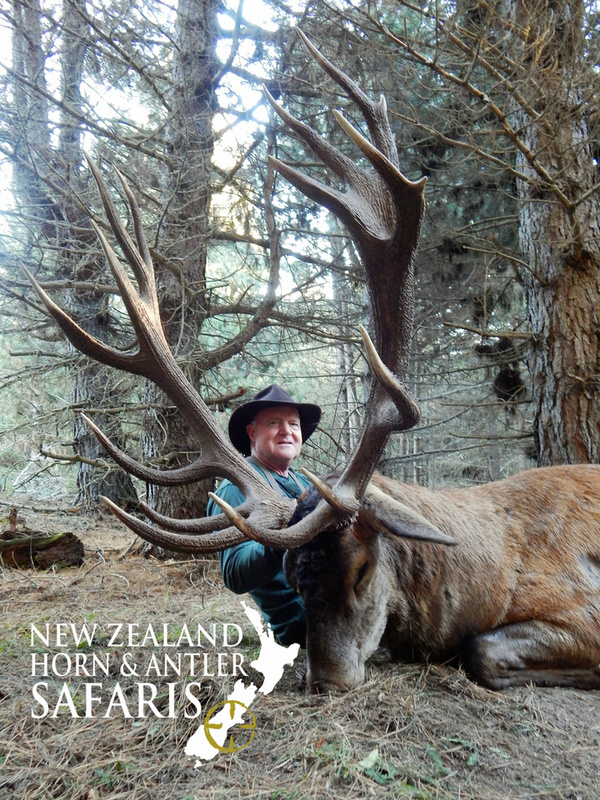 I could reiterate to you everything you probably already know about New Zealand and the nostalgia of chasing the majestic Red Stag. But that’s not my style! 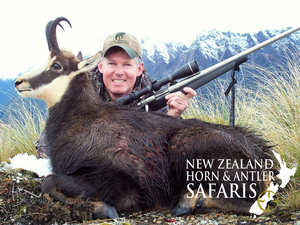 Pick up the phone, hop of Facebook, or google the words NZ HORN & ANTLER SAFARIS. 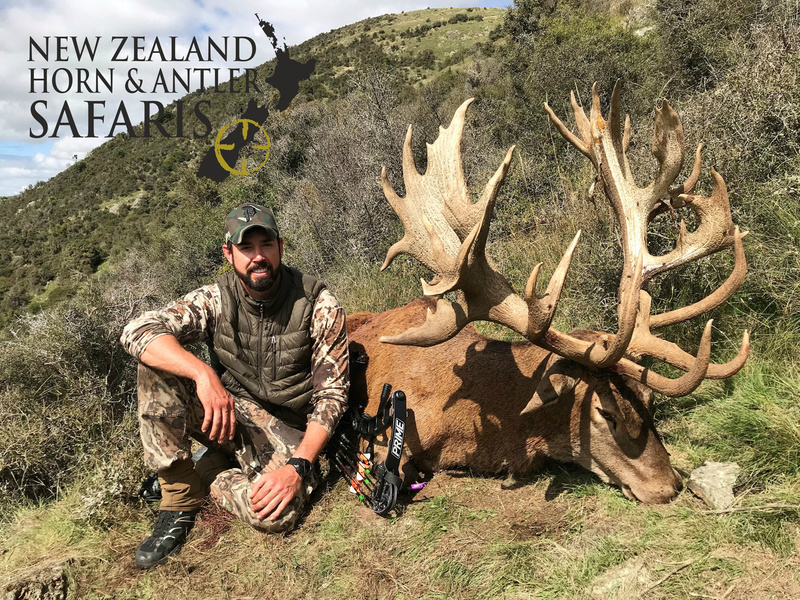 If you’re reading this testimonial, you're already interested in knocking New Zealand off of your sportsman’s bucket list. Do it! 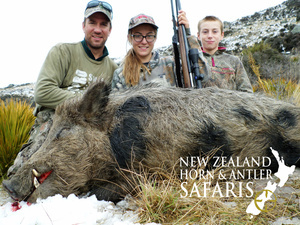 For the same cost of chasing quality North American big game in the USA or Canada, instead, go to NZ! You will not be disappointed! Do it before you find another excuse to not do it! Go on your own and test your skills or bring someone you can share a lifetime memory with. Why wait? Be the sportsman that has something to bring to the fire pit besides another boring story of shooting a whitetail from a tree stand during the rut! Live your life! Save your money for next year, open a line of credit, do a reverse mortgage, or rob the rich SOB up the street! Be the person that said, “why not”! I’ll be back to chase the alpine Tahr and Chamois and I hope I see your wonderful self in Waimate! In the end, we only regret the hunts we didn’t take! 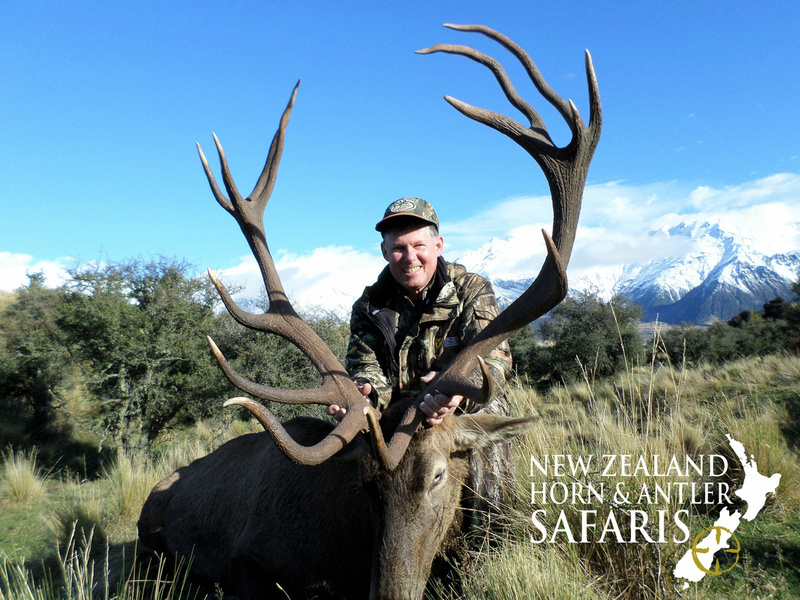 I had a wonderful time hunting in New Zealand with New Zealand Horn & Antler Safaris. Thank you Craig, Hunter, Jenny and Sophie! Hunter, my guide for the hunt, was always making sure we worked hard to get the Red Stag of my dreams but also made sure that we hunted at a pace suitable to me. He did a great job! Craig & Jenny made their home so welcoming & enjoyable & the meals were always great. Thanks to Sophie for transferring pictures from Hunter's camera to a USB card for me to take home. I have looked at them many times & enjoyed showing them to family & friends. My trip was truly a memorable one and my Stag and Rams are incredible!! 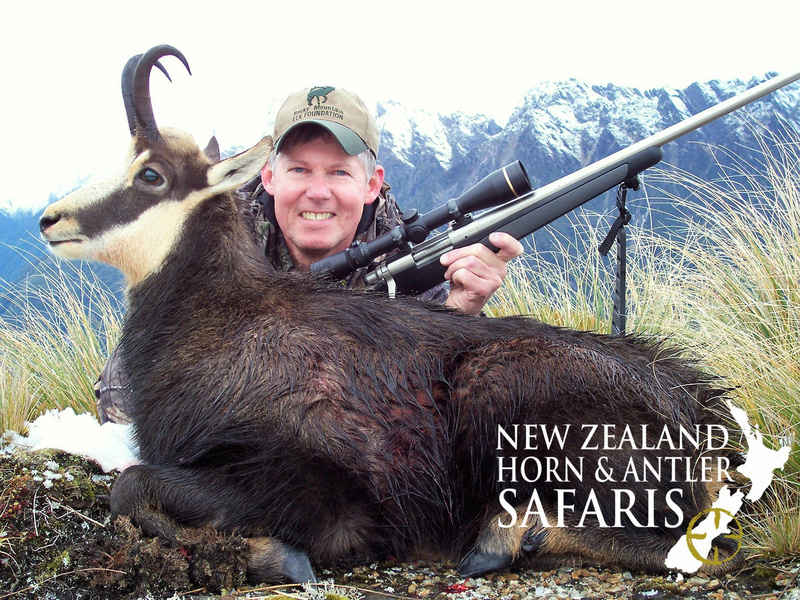 I would highly recommend New Zealand Horn & Antler Safaris to anyone looking to hunt in New Zealand. You just couldn't find a better outfit than them! The country is so beautiful too! Thank you again for a great hunt & your hospitality! Maureen & I would like to thank you both, along with Hunter Dane, for providing us with an extraordinary experience in your New Zealand homeland. The services you all provided were perpetually attentive and professional. Moreover, the quality of hunting exceeded that which is described on your web site and literature. We can confidently recommend your concession to anyone seeking a high quality New Zealand hunt; be it waterfowl, estate-style and/or fair chase. 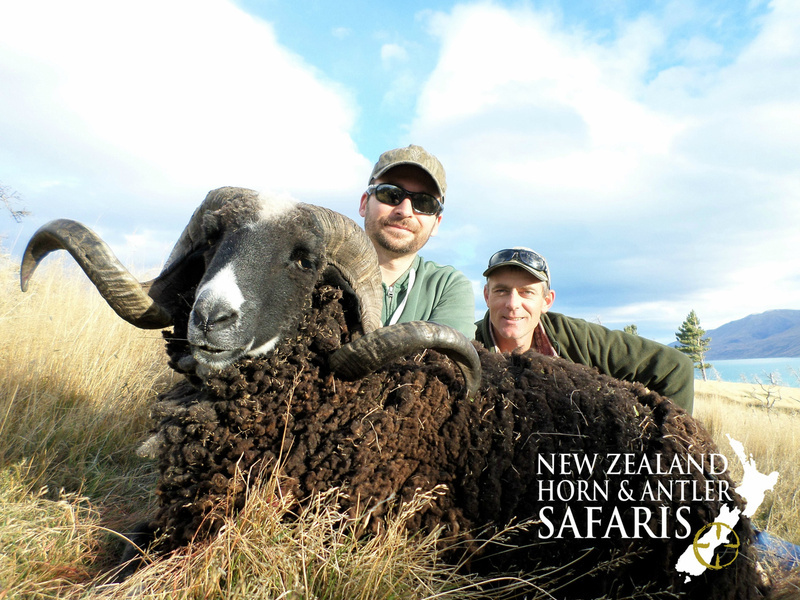 Particularly, I was impressed at how the tahr hunt so closely approximates a North American sheep hunt. The species is magnificent and the manner in which you hunt them is world class (at a fraction the cost of a big horn, Stone or Dall). We look forward to spending time in the field with you in the future. Only a great guide could put together a great duck hunt with such little notice. I emailed Craig (and several other guides) less than 2 weeks before my trip to NZ in the hope that someone may have been able to help me out. Craig replied in no time that he could see me right, and how right he was. 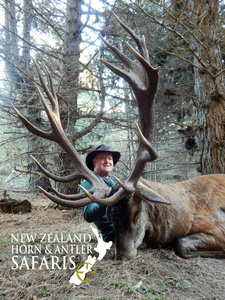 Craig collected me from Christchurch and drove us to our hunting properties. Our accommodation was warm and cosy and Craig supplied all that was needed for our weekend hunt. I had booked a two day hunt but with plenty of daylight left after settling in on Friday Craig suggested an evening goose hunt would be possible. After discussions with the local farmer we set out the decoy spread and waited. "here we go" Craig whispered as the geese headed our way. 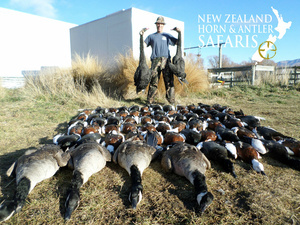 A small mob of 15 or so winged straight into our spread and we were able to bag four. Saturday saw us up early to head out on a "Pari" hunt. We had scouted the area the day before to check the birds were still in the paddocks Craig expected. We didn't have to wait long Saturday morning, the Paradise ducks arrived in singles, pairs and mobs of 30 and more. This proved to be the case for the rest of the weekend as well. We hunted many different locations and the ducks came to them all. Good scouting on Craig's behalf ensured we were in the right spots. In Australia I can do my own scouting and arrange my own hunts but for hunting NZ I recommend placing your trust in Horn and Antler(should be Feather to) for a great kiwi duck hunt. Aka, Bush from Foolin With Foxes. Wanted to send a quick note to thank you again for a great trip. Brett, Kate, and myself had an awesome time hunting with you this past August. Both kids have memories to last a lifetime. We knew the weather was going to dictate the hunting; but despite record NZ snowfall, the hunting still exceeded our expectations. We covered a lot of the South Island and hunted some beautiful and varied terrain. Thanks again to both yourself and Jenny for the top shelf hospitality and to you for the hard work to get some well earned NZ trophies. "I really enjoyed how much I learned about NZ's culture and history while we were there. The variety of hunting spots was great and we got to see so many amazing animals and some breathtaking scenery. Making that long shot across the gorge on that wild boar was a real confidence builder for the rest of the trip. I definitely enjoyed the entire trip and would go again in a heart beat. Thank you." 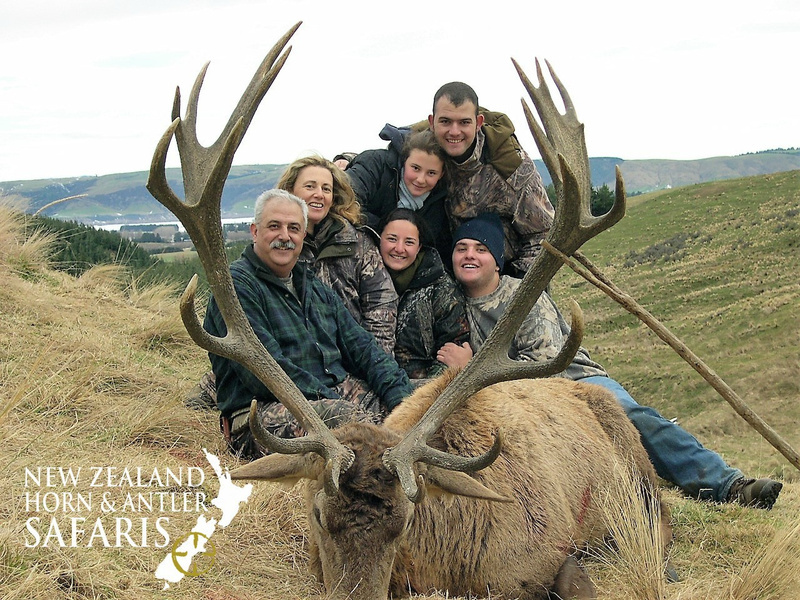 My girlfriend and I had the pleasure to hunt with New Zealand Horn and Antler this past June, 2014, and it was without a doubt the highlight of our two month vacation throughout New Zealand. Craig was energetic, fun, and when it came down to the hunt, 100% committed to finding me the best animal possible. Hunter, his apprentice, was hard-working and quick to help when needed. The hunt was exciting and I couldn't be more excited with Ram we got! Everybody involved was accommodating, the food was great, and the scenery was awe-inspiring. It was truly like hunting inside a postcard. My girlfriend, a non-hunter, thoroughly enjoyed her trip as well. She always had something to do or someplace to explore! The two of us were making plans to go back even before our first trip had ended. Please feel free to contact me for anymore information about this once in a lifetime trip! We had an incredible time while in New Zealand and we can't imagine having better hosts than the two of you. Craig went above and beyond what was expected to ensure that I had the hunt of a lifetime. My Tahr and Chamois hunts were outstanding. Each time I walk by my mounted trophies I'm flooded with great memories of our time in New Zealand. After the big game hunts were over, I thought it was time to kick back and relax. Craig had other plans. In the mornings and afternoons we went waterfowl hunting. I was able to get a beautiful pair of Paradise Ducks and a Black Swan along with the many ducks and geese. Great waterfowl hunting, far better than I expected. In the evenings we were off after the Wallaby's. Great side trips after the main hunt is over. We can't wait to come back. I believe I left some unfinished business. I would love to come back for Red Stag and Fallow Deer along with some more of that fabulous waterfowl hunting. Kathy's sightseeing trip with Jenny was beyond compare. She saw many beautiful sights and took so many incredible photos. New Zealand is truly a photographers paradise. Kathy especially enjoyed the spa trip, the mountains and glaciers. She also really enjoyed the Milford Sound boat cruise along with the seals and blow-holes along the coastline. Jenny was very knowledgeable of all of the best sites on the island. I'm sure there are still many beautiful sights left unexplored. So much to do with so little time! Often in times it's very awkward when you're in a situation where you spend a great amount of time with someone you've never met in person. Craig and Jenny made this potentially difficult situation so easy. We came together as strangers but left as friends. They were so easy to get to know and very accommodating. Craig even overlooked the many times I tried to get in on the wrong side of the vehicle. I was able to get past him driving on the "wrong" side of the road. It's hard to believe our second trip to New Zealand has come to an end. Our two weeks went by so quickly. What an unbelievable adventure this has been, truly the trip of a lifetime. You and Jenny have again surpassed our expectations. Although I know we've only scratched the surface of what New Zealand has to offer, you've set the bar high for any future trips. You're going to be a hard act to follow. I have to admit, when you wouldn't let me shoot my Red Stag on the first evening, it was a bit frustrating. You encouraged me that there would be more opportunities, to relax and enjoy the hunt. In the end, I'm glad you made me wait. That portion of the hunt would have come to an end much too soon, and I ended up with an incredible stag. The second stag, also a great animal, was just icing on the cake. The Arapawa Ram hunt was a lot of fun and you helped me to get a very nice ram. The waterfowl hunting was a blast. My favorites are the Paradise Ducks. Imagine what our total bag would have been if we could have hit them on a more regular basis. Obviously, I'll need to brush up on my wing-shooting skills before we do that again. The new duck blind has to be seen to believe. With the small game hunting in between the other hunts, what more could a guy ask for? I think I'm spoiled. Kathy's tour with Jenny was amazing. Everything went very smoothly. She had a great time and came home with some awesome photos. It sounds like they were going non-stop, a new adventure each day. You just can't beat having your own personal tour guide, experienced with all of the best sites on the south island. It was also reassuring to me to know that she was off having as much fun sightseeing and shopping as I was hunting. Some of Kathy's favorite spots were the Cathedral Caves and McLeans Falls in the Catlins. She also enjoyed Te Anau and the glow worm caves, Arrowtown and the Lake Wanaka area. We both enjoyed watching the penguins come in from the sea in the evening. Although I can't promise that we'll make it back to New Zealand again anytime soon, you can rest assured that if we do, Kathy and I will be contacting you and Jenny to assist in planning of our next adventure. We will recommend you and Jenny without hesitation to family and friends and anyone else looking for that trip of a lifetime. I was the successful bidder of a Tahr and Chamois hunt Craig donated to my local SCI chapter's fund-raiser. The hunt was a drop off hunt by helicopter high in the mountains where we stayed in a spike camp. The first day we hunted for Chamois and I was successful in getting a very nice buck Chamois and thank goodness we did as I rolled my ankle on the mountain and that placed me in a great deal of pain. With the weather turning from bad to worst, Craig did a great job getting me back to our camp as this was no place to get caught out in the weather with a bung ankle. The next day the weather cleared and Craig radio the helicopter pilot and we flew to a remote mountain cabin where I rested my ankle. 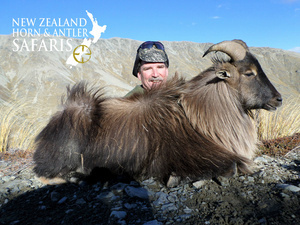 Unable to climb around the mountains for a Tahr, Craig arranged for me to hunt the Tahr with the use of the helicopter. Craig and I were dropped on a cliff as the helicopter hovered next to it. This gave me a 250 yard shot across canyons.This made it possible for me to come home with a very nice Tahr. 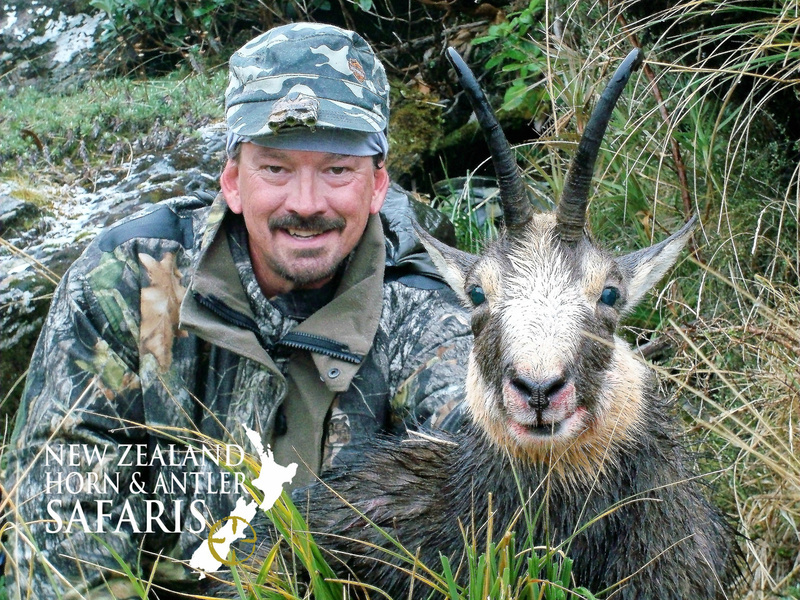 After the Tahr hunt we traveled to Craig's home on the East coast where I shot a nice Red Stag, Arapawa Ram, Wild Goat, Australian opossum, Wallaby and enjoyed some water fowl hunting. My time in New Zealand was a great success thanks to Craig, he kept me pulling the trigger every day I was there despite rolling my ankle. I think that every outdoors man should experience being dropped off in the beautiful New Zealand mountains by helicopter to do the real hunt and survive on what is in your back pack. Craig did an excellent job preparing trophies to be sent back to the USA. My animals turned out awesome. You do not see full body trophies of Tahr and Chamois in any of the hunting stores, However, I have them in my trophy collection. was a great time for my whole family. The main ingredient for such success was Craig and Jenny. We spent 20 days in the south island looking for Red Stag, Tahr, Chamois, waterfowl and small game, along with some sightseeing. We got every thing we expected. But it was not only the superb quality of the trophies, or the breathtaking landscapes we enjoyed, but the professionalism and dedication of Craig and Jenny that made this such a remarkable memory for our family. They were on top of things all the time, taking care of everything, and knew how to cope with our rhythm, considering our physical condition and climbing experience. My wife and I can highly recommend Craig and Jenny as guides and encourage you to experience New Zealand.